Matthew Murdock's civilian clothing is a bit different than his black-masked vigilante costume. Not only for the obvious reasons, but his lawyer suits aren't off the shelf or ordered online. For a fresh out of law school lawyer, his suits aren't cheap. What Kind of Suit Does Matt Wear? ​Matt's suits are actually pretty simple. Since he's blind, the costume designer wanted to reflect that in his every day clothing. In an interview​, Daredevil costume designer Stephanie Maslansky said, "Because, obviously, he can’t see his colors, but he has to know anything he chooses is going to coordinate with one another." Matt's different ties, shirts and belts all match his different suits. How? His suits and the accessories (tie, belt, shoes) are all greys, blues, or blacks, which means at least his style will be easy to imitate. 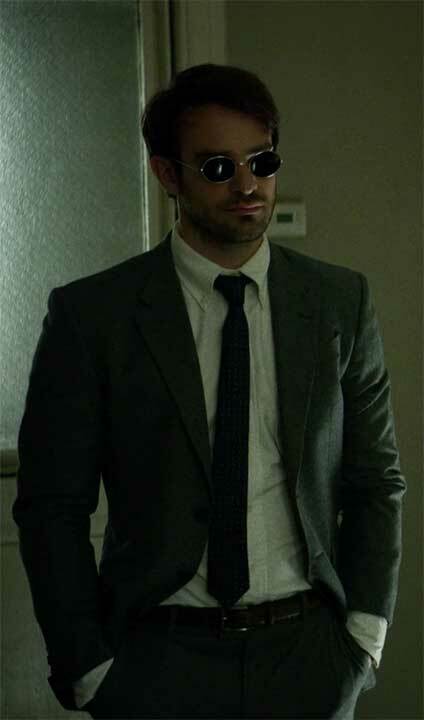 According to Daredevil's costume designer, "Mostly he wore Paul Smith suits, we found that they fit him best." ​This is great to know, but also keep in mind that these suits were also tailored to fit Charlie Cox, so you may find that they don't fit you as well as they do him. On top of that, Paul Smith suits are relatively expensive ($1,000+). I'm not sure if it's possible to tell exactly which suit Matt's wearing, but they're two piece, two button suits. As far as colors go, he sticks with greys and black (again, makes it easy for a blind man to match his clothes if they all match). ​Personally, I wouldn't want to spend that much money on a suit, just to cosplay or even dress similar to someone. I'd get something on the less expensive side, like this grey two piece suit. If you already own a suit that looks similar to Matt's, then even better. In my opinion, the biggest parts of Matthew's normal clothing isn't just the suit jackets or dress pants, but the button down shirts and shoes. ​At first glance, some people might find it a bit strange that Matt's wearing these relatively nice suits, but with OCBDs instead of normal dress shirts. Again we're brought back to Matt's wardrobe is built around the fact that he's blind. These shirts are much more textural than your standard dress shirt. ​On top of something like the sense of touch being very important, the more ruffled look that the OCBDs provide are perfect for a blind man. His clothing shouldn't ever look perfect...because how would he know? ​I haven't seen any brands or logos on any of the shirts Matt wears, so I'm not 100% sure what brand he wears. I would assume that whatever brand it is, they don't have their logo on the shirt (although the costume department could have removed the logos). ​In the interview with the costume designer, one of the captions reads, "Charlie Cox in his Black Fleece shirt..." Brooks Brothers are the ones who make Black Fleece OCBDs, so I can only assume that Matt's shirts are Brooks Brothers. Similar to the suits, these shirts are pretty expensive. If you'd like a cheaper alternative to Brooks Brothers, these ​Van Heusen OCBDs have great reviews. They also carry a ton of colors, so you'll be able to match with Matt's wardrobe colors pretty easily. ​One of the simpler things here I guess would be Matt's ties. He really only sticks to a couple of different colors here, mainly black and dark blue. He does occasionally break this up with lightly patterned ties. For instance, in the last scene of the season finale, Matt's wearing a dark blue tie with light geometric looking patterns on it. This Jon vanDyk dark blue patterned tie looks a lot like the one Matt wears in that episode. Of course it's not an exact match, but gives the same style. If you'd prefer a solid colored tie, I think this black one or this blue one on Amazon would work great. ​The belt Matthew wears with his lawyer suit looks pretty basic. He seems to stick with black for the color, and it's a solid, thinner belt with a silver buckle. If you don't already own a dress belt like that, this Geoffrey Beene dress belt would work perfectly. ​I am by no means a dress shoe expert, but Matt's look like oxfords to me. They're definitely lace-ups (not slip-ons), but they don't look like they have any detail on the toe (ridges, seams, etc.). ​I think these Calvin Klein oxfords look almost identical to Matt's dress shoes. Make sure you're looking at the normal black ones though, because Matt's shoes definitely aren't shiny. ​Matt doesn't wear a jacket or coat very often on the show (other than suit jackets, of course). In the season one finale, he's seen wearing a pea coat the majority of the time we see him. This coat doesn't look too out of the ordinary, it looks like a pretty standard pea coat. Matt's has eight buttons (four on each side), with side (horizontal opening) breast pockets and straight (vertical opening) front hand pockets.​ I don't see any epaulets on the shoulders, and it looks like a hip length coat. ​I'm not sure which brand his coat is on the show, and I haven't been able to find anything that matches exactly. So instead I just went with the closest I could find. One of the closer matches I found was this Doublju pea coat. It's the closest I've found in looks so far, as it has the horizontal breast pockets and vertical hip pockets, but it's a little too short to be exact. Matt's coat ends at the hip, while this one ends at the waist. ​ Another thing that bothers me are some of the poor reviews it's gotten, but of course if you're just using it for cosplay, that doesn't matter too much. ​This last one I actually like more than the previous, although I don't think it comes as close to matching Matt's. It's this BGSD pea coat, and while I think it looks nicer, and it got much better reviews, it doesn't have the pockets in the correct places. It's also a bit more expensive, but gathering from the reviews, this is actually a great jacket. ​Unfortunately, Matt's sunglasses are custom. That doesn't necessarily mean the frames themselves were custom fabricated or anything like that, but the frames could be slightly modified. And I'm sure the red lenses themselves are custom. ​While I still haven't found an exact match to Matt's red sunglasses, I have found a few that look pretty close. Keep in mind that while his glasses look round, they actually have a slight elongated oval shape. You'll really notice this if you end up getting round sunglasses and trying them on - they're just a bit too round. My favorites are these Ray-Ban ​RB3447 with red lenses. They're rounded without being circles (the shape looks really close to Matt's), but the red tinting of the lenses isn't the same as Murdock's. ​The second pair I like are these small circle, red lens sunglasses. These are definitely too round compared to Matt's frames, but they're not too far off. Another thing to be careful of is the size (diameter) of the lenses. Matt's look like they're at most an inch and a half. I ordered these larger circle frame sunglasses, and the lenses were just way too big. ​The cane was actually something I found surprisingly quickly, but not on my own. While I was writing my article on Matt's ninja costume, I saw that Chris92 at The RPF found an exact match to Matt's cane. ​Ambutech is the name of the company that sells them. 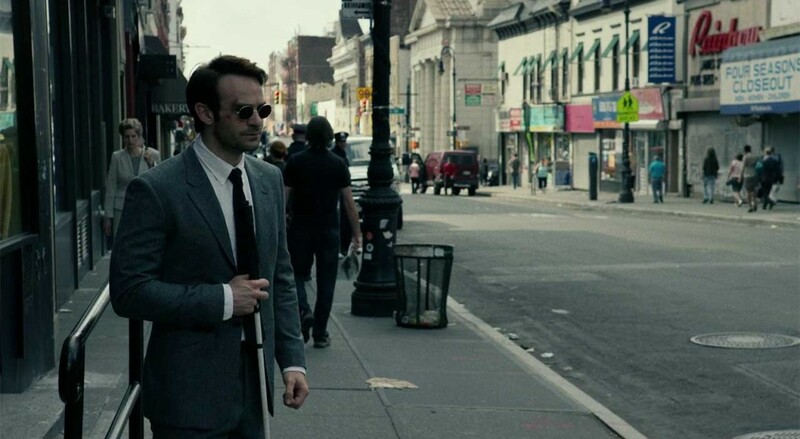 To match Matthew Murdock's cane, you'll want a 52 inch, 4 piece folding fiberglass cane with a pencil tip, and white/red as the colors. They're pretty cheap (less than $30), but shipping does take a while. From the time I placed my order to actually receiving the cane, it took about two weeks. I re-watched the scene a few times (season 1 episode 12 if anyone else is interested) and I didn’t catch any brand logos or lettering. So I just did a bunch of relatively generic searches based on the look of the jacket, but I wasn’t able to find anything. It looks like it’s got a leather collar, but the rest of the jacket looks like canvas or something, it’s kind of hard to tell. It also has a bit of a military look with the cinch-waist, big collar and big breast pockets.